Why is a Recruiting Database so Important? A quality recruitment database is a staffing firm’s lifeblood. It is an essential tool for storing and managing candidate information, matching applicants with jobs, and streamlining the recruiting process to save you time and money. The benefits of a quality candidate database are undeniable - for starters, candidates from an existing database are a recruiting firm’s top source of placements. In today’s competitive job market, professional recruiters must operate at optimum efficiency in order to increase their placements and grow their business. A well-maintained database enables your recruiters to better communicate with candidates, spend less time on tasks that don’t add value, and more time on relationships. Once you determine your firm’s database needs, you’ll be well-positioned to make more placements more efficiently in less time. 1. Is your recruiting database part of your ATS? Before you choose a database, it’s best to find a system that can grow with you. Having a candidate database that is a part of your ATS will save you crucial time and money as you build your business. 2. How are you growing and maintaining your database? While growing your database is critical, be sure that you don’t compromise on the quality of information. It’s important to ensure that you’ve screened candidates so that your database continues to be efficient and effective. As new candidates and information is added to your database, use the right technology tools to parse resumes and reach out to candidates to fill in gaps. Having accurate information will ensure that your database remains one of your most valuable assets. 3. Does your recruitment CRM have the right tools? A CRM can provide additional tools and features that enable you to streamline the recruiting process and make the most of your database. Think of what tools are important to your staffing firm - Do you want to be alerted of duplicate records and archive inactive ones? Do you want to save time by integrating to job boards and find current candidate information with a LinkedIn integration? Is it crucial that your CRM can integrate with your email system to help better manage relationships? Pinpointing the tools and features that are the most helpful to your business will set your firm up for future success. By evaluating the strengths and weaknesses of your candidate database, you’ll be in a great position to improve it. Database maintenance isn’t a one-off duty, but the rewards are tremendous. Ongoing maintenance monitoring and training will not only give you clean data, but it will also improve your fill rate and consequently your revenue and profitability. A well-managed database is one of your greatest—and most valuable—assets. Why Should You Use Bullhorn's Recruiting Database? Streamline daily tasks with faster source, search, and match. Match candidates to the most suitable opportunities for their skill sets. Meet client requests faster and with better candidate matches. Connect with candidates anytime, on any device. Recruiters are constantly on-the-go. Your recruiting database must be built to keep up with recruiters' fast-paced lives and help them make their job easier. With mobile access to a recruiting database, recruiters will be armed with up-to-the-second information about candidates, giving them better insight for offsite meetings and interviews. 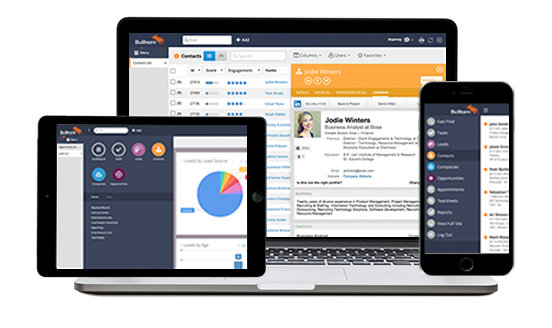 Bullhorn's recruiter software offers mobile recruiting capabilities that let you view and edit candidate records, create notes, and access placement data on any device. Bullhorn offers a staffing-specific applicant tracking system integration with LinkedIn Recruiter to streamline a recruiter's workflow, reduce clicks, and provide a continuously up-to-date view of candidate information. 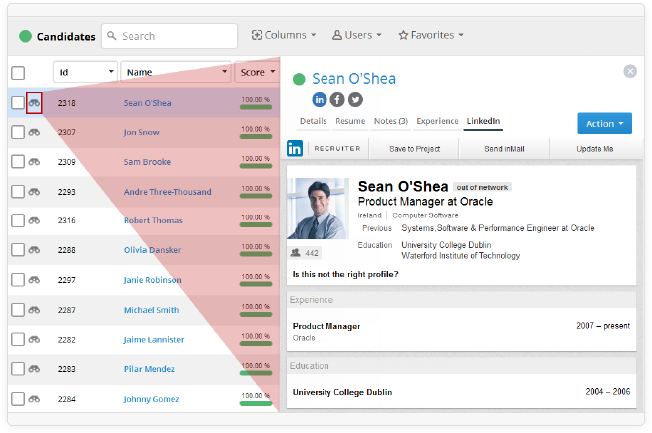 From Bullhorn you'll be able to view candidates’ or clients’ LinkedIn records. From LinkedIn Recruiter you can see if the contact’s record is in Bullhorn, and if so, click to view that record in Bullhorn. Bullhorn's recruiting database automates the time-consuming tasks that take up valuable hours in your day. Maximize efficiency, and reduce clicks and errors by leveraging Bullhorn’s parsing engine to extract information – no matter where you find it – to pre-populate fields in Bullhorn candidate, contact, and job records.